A.D. At the end of the 5th century A.C., Caesaraugusta suffered the disintegration of the west Roman Empire, which culminated in the city being overrun in 472 by the Visigoths. 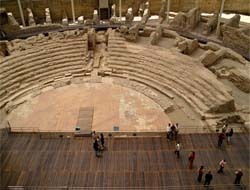 The most interesting remains from the roman period are the museums of Caesaraugusta Forum (#8) at the East corner of Plaza del Pilar, and the Roman Theater (between #25 and #26) in plaza de San Pedro Nolasco. Also worth a visit are the Roman walls (#1), the River Port (#11) and the Public Baths (#26). Zaragoza at the height of its grandeur. The palace currently contains the Cortes (regional parliament) of the autonomous community of Aragon. 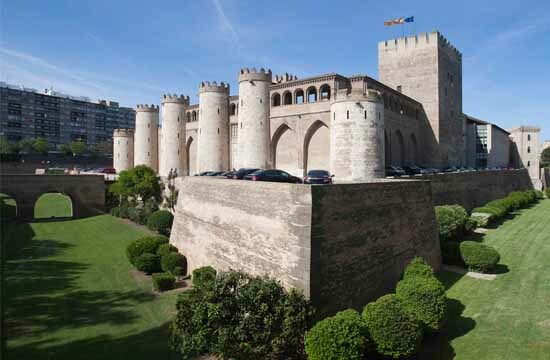 If there is a single monument that, on its own, is worth a trip to Zaragoza, it is the Aljafería Palace. The palace can be easily reached from the RSS venue, just exit to the left and walk along Paseo de Pamplona and Paseo de María Agustín for 15 minutes, turn left at Avenida de Madrid, and walk another 200m. In 1118, after the conquest of the city by the Christian king Alfonso I, -El Batallador-, Zaragoza became the capital of the kingdom of Aragon. Mudéjar is the name given to Muslims of Al-Andalus who remained in Christian territory after the Reconquista but were not converted to Christianity. The Mudéjar style, a symbiosis of techniques and ways of understanding architecture resulting from Muslim and Christian cultures living side by side, emerged as an architectural style in the 12th century on the Iberian peninsula. It is characterised by the use of brick as the main material. Mudéjar did not involve the creation of new shapes or structures (unlike Gothic or Romanesque), but the reinterpretation of Western cultural styles through Islamic influences. It became most highly developed mainly in Aragon, especially in Teruel, but also in Zaragoza, Utebo, Tauste, Daroca, Calatayud, etc. The Mudéjar Architecture of Aragon is a UNESCO World Heritage Site. 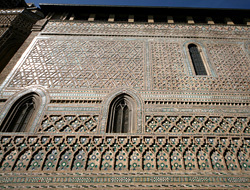 In the city of Zaragoza, the most interesting mudejar monuments include the apse, parroquieta and dome visible in the north side of La Seo Cathedral (#9), the mudejar part of the Aljafería Palace, and the splendid towers of San Pablo (#38), Santa María Magdalena (#14) and San Gil (#25) churches. And guess what? Most of them can be enjoyed while going for tapas in the old city. Christian tradition holds that on 2 January 40 AD, while St. James the Apostle was deep in prayer by the banks of the Ebro, the Virgin Mary appeared to him descending atop a marble pillar. About a year after the apparition James arranged to build a small chapel in Mary’s honor, which was repeatedly replaced by different style churches until the current baroque basilica, finished in year 1686. The legendary pillar is venerated by thousands of catholic pilgrims every year. The finest artworks are the gothic alabaster altarpiece sculpted by Damian Forment between 1509 and 1512, and the domes painted by Francisco Goya in 1772-1781. Willtron, the copyright holder of this work, hereby publishes it under the following license: Creative Commons Attribution-Share Alike 3.0 Unported license. La Catedral de El Salvador (Cathedral of the Savior) is commonly known as La Seo (Aragonese for “see”) to distinguish it from the nearby El Pilar. The two share co¬cathedral status in metropolitan Zaragoza. This image was originally posted to Flickr by FRANCIS RAHER at https://flickr.com/photos/121084837@N08/16303039225. It was reviewed on 17 October 2015 by the FlickreviewR robot and was confirmed to be licensed under the terms of the cc-by-2.0. La Seo was built on the site of the ancient Roman forum of Augustus and of the main mosque of the Moorish city of Saraqusta, elements of whose minaret form part of the current tower. The construction began in the 12th century in the Romanesque style, and underwent many alterations and expansions until 1704, when the Baroque spire completed the tower. The cathedral is a mixture of styles, from the Romanesque apse (12th century) to the Baroque tower and Neo-Classical main door (18th century), passing through Mudéjar and Gothic. La Seo has also a Museum of Tapestries with an impressive collection of 14th to 17th century Flemish and French Tapestries.